On tap at Plank Pizza, fine Cascadian Dark Ale loads sugar-sweetened black chocolate syruping onto less prominent black grape, yellow grapefruit and currant illusions as well as moderate charcoal-stained dark roast hop char. Muskily bitter Cascadian Dark Ale complements smoky black chocolate malting with charcoal-singed dark roast hops and overwhelmed black grape, pineapple and grapefruit murk. Dirty earthen bottom retains ashy mocha bittering. 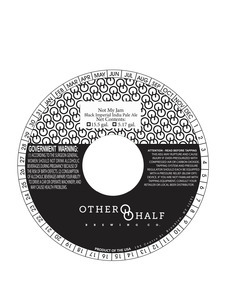 On tap at Shepherd & Knucklehead – Hoboken, grain-roasted dark chocolate malting, musky black grape tartness and scorched earthiness converge for fulsome medium body. On tap at Ambulance, stylishly moderate Cascadian Dark Ale sidles charcoal-burnt dark chocolate and black coffee overtones with dry Citra-hopped grapefruit, orange and lemon tang plus charred pine remnant above dry oats spine. Less pronounced bitterness will draw in softer palates. On tap at Poor Henry’s, legit gluten-free dry body takes on Cascadian Black Ale style with relative success. Designed to taste like a “Black & Tan shaken up,” robust ebony-hued Jerseyite layers charcoaled medium-roast coffee bittering atop hop-charred black grape, pineapple and grapefruit illusions. Resinous pine tones deepen the bitter end. On tap at River Of Beer, polite dark-roast chocolate malting picks up mild coffee-cocoa tones above relegated pineapple, grapefruit and black grape notions. Black currant-like charcoal hop astringency lingers lightly beside pervasive mocha setting. Mighty stout-like traits outduel India Pale Ale-styled dark-roasted hop char and mild pine-sapped dried fruiting for truly awesome Cascadian Dark. Creamy caramelized black malts and raw molasses bittering set up bittersweet black chocolate-roasted cocoa dryness. Ashen hazelnut-cola-walnut conflux rides below alongside modest black cherry, prune and pink grapefruit illusions. Dense malt-hop profile proves richer than many stylistic competitors. On tap at Ambulance, “paradoxical” Black India Pale Ale works smoky hop-charred black patent malts into sweet ‘n sour fruit tartness. Moderate black grape, pineapple, orange and tangerine illusions graze cocoa-powdered dark chocolate roast. Latent anise influence affects dried-fruited mocha finish. Well-designed ‘Planets Series’ release (circa 2014) is Bell’s first foray into Black IPA styling. Dehusked black malt roast reinforces syrupy dark chocolate entry that peaks above zesty citra-hopped resilience and resinous pine sapping. Caramel-burnt molasses follow-thru sweetens dark mocha theme above lemony grapefruit-pineapple bittering as well as black grape tartness and distant clementine-tangerine-peach-mango inkling. Caliginous mocha-influenced IPA brings dark-roasted black chocolate malting to resinous piney hop bittering and mild nut char, leaving stylish grapefruit-pineapple contingent way in the back. Light cocoa, coffee and raw molasses undertones fasten richly bittersweet mocha finish. On tap at Ambulance, fascinating Imperial Cascadian Dark places black-patented dark chocolate malting atop sappy pine tarring – blindsiding brisk grapefruit, pineapple, orange rind and black grape fruiting with a heavily roasted hop char. Tertiary black licorice, black coffee and charcoal illusions deepen massive mocha madness.